An urban business hotel located in the heart of business & commercial district of Seoul, Novotel Ambassador Gangnam presents a special jazz dinner show featuring a French saxophone jazz band "Ossia" on September 26 at Champagne Room on 2nd floor. 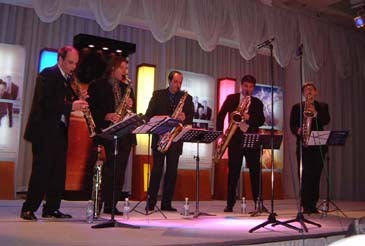 Ossia, composed of 5 saxophonists who are professors at National Superieur de la Musique de Paris, made their debut in 2003 and has been actively performing all over the world with their versatile talents and memorable harmonies. The special performance by Ossia is co-hosted by Novotel Ambassador Gangnam and the French Cultural Center to celebrate 120th anniversary of Korea-France amity and will give the saxophone lovers a memorable evening. The dinner show, starting at 7pm on September 26, features a 5-course menu dinner followed by the 80-minute Ossia's performance kicking off at 8. The ticket is 60,000won plus tax. Join us on September 26 and fall into passion and delight of jazz at Novotel Ambassador Gangnam.